Good morning ... Hard to say whether our Democratic or Republican readers are more hungover this morning, but either way, grab yourself a Gatorade and some carbs and let's do this. 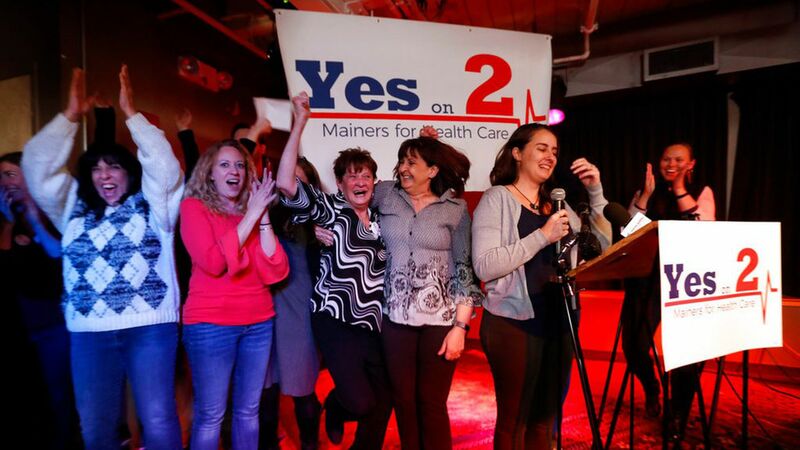 Last night, Maine became the first state to expand Medicaid via referendum and the 33rd state (counting D.C.) to adopt the Affordable Care Act's expansion one way or another. And in Virginia, Democrats' unexpectedly large gains in the state's House of Delegates made expansion a much more realistic prospect there, too. The big picture: Last night was a huge night for Democrats, and health care was a huge part of it. Exit polls in Virginia showed that health care was the No. 1 issue for a plurality of voters — and 78% of those voters broke for Democrat Ralph Northam. Virginia already had a Democratic governor. The party's immense gains in the state legislature, where past efforts to expand Medicaid failed, are what move it closer to reality. Maine's Medicaid expansion might be somewhat delayed. Some expansion advocates expect Gov. Paul LePage, a fierce expansion opponent, to run out the clock and leave the actual implementation for whoever takes over after he's term-limited in 2018. Even so, last night's referendum will bind his successor, too. It's happening eventually. The emotional win might be the most important. The main takeaway for Democrats across the ideological spectrum last night: They can, in fact, win, and win big, and win on health care issues. Even, or maybe especially, when President Trump and congressional Republicans are still fixated on some form of ACA repeal. The results from Maine, whenever they actually take effect, have already mobilized Democrats to try to get similar initiatives on the ballot next year in more non-expansion states. Look for Idaho, Kansas and Utah to be at the forefront of those efforts. And if last night does turn out to be a sign of what's to come in 2018, don't expect any more ACA repeal bills to pass the House. Whatever provisions Republicans think they can actually agree to repeal, delay or weaken, they'd better repeal, delay or weaken soon. One last thing: Ohio voters overwhelmingly rejected a ballot initiative to cap what state-run health programs would pay for prescription drugs. The bottom line: Governing majorities come and go, but pharma always wins. More people are surviving a cancer diagnosis today than in the 1970s, according to a report released earlier this year by government agencies and cancer groups. That's the good news for former Vice President Joe Biden, who's speaking with Mike Allen at an Axios event in Philadelphia today as he continues his work to speed the progress of cancer research. But the survival rates are still low for several kinds of cancers — including brain cancer, which killed Biden's son Beau. What's next: Immunotherapies are one promising area of cancer treatment, but there are questions about why checkpoint inhibitors (one class of immunotherapeutic drugs) work in some patients but not others. Go deeper: Axios' Alison Snyder and David Nather break down the latest developments in immunotherapy. The chief executive of pharmacy benefits manager Express Scripts is open to coming back to the negotiating table with health insurer Anthem, even though the two companies have been at each other's throats for months, Axios' Bob Herman reports. Background: Anthem and Express Scripts are embroiled in lawsuits over drug costs, and Anthem is ending its contract with Express Scripts in 2020 to build its own pharmacy benefit manager with the help of CVS. What we heard: "I would welcome a conversation with the new leader of Anthem," Express Scripts CEO Tim Wentworth said at a Credit Suisse conference Tuesday, following the news that Anthem CEO Joe Swedish is retiring and Gail Boudreaux would take his spot. Between the lines: Wentworth knows the company's contract with Anthem is very lucrative, and he sees an opening to salvage that deal — even at lower-priced terms — with Swedish leaving. Why it matters: These findings offer a rough sense of what we can control, and what we'll just have to live with, if we want to rein in the growth in health care spending. The population is going to keep growing and getting older, for example — nothing we can do about that. But a 50% spending jump due to the underlying cost of treatment is something policymakers could at least try to address. A growing number of seniors are facing especially high prescription-drug costs, saddling them with thousands of dollars in out-of-pocket spending, according to a new analysis from the Kaiser Family Foundation. How it works: Medicare's drug benefit includes "catastrophic" coverage — once you've spent a certain amount out of pocket (roughly $5,000), you only have to pay a fixed percentage of all your remaining drug costs for the rest of the year. But more seniors are hitting that limit, and they're facing higher costs once they do. About 1 million people hit the catastrophic limit in 2015, according to Kaiser — double the number who reached it in 2007. That's just 2% of all Part D enrollees. But they account for 20% of the program's out-of-pocket spending on drugs. These increases in seniors' out-of-pocket costs are being driven, in part, by two new treatments for Hepatitis C — Sovaldi and Harvoni. Overall, across the entire Part D program, seniors spent an average of roughly $500 per year on prescription drugs. Among those who hit the catastrophic limit, the average is more than $3,000. Among patients who hit that limit and are taking either Sovaldi or Harvoni, the average climbs to $6,700 in out-of-pocket costs. Go deeper: Cases of Hepatitis C are growing rapidly, in part as a side effect of the opioid epidemic. And because it's driving so much out-of-pocket spending, those costs seem likely to keep going up as well. Aetna CEO Mark Bertolini has been talking with retail giants and the architect behind the Apple and Tesla retail stores about ways to make visiting the doctor more like going to the mall, Axios' Ina Fried reports. "We have conversations going on with Walmart and Walgreens and CVS, with all these players about creating an in-store concept that looks more like an Apple Store than it looks like a drug store," Bertolini said yesterday. Read more of Ina's piece here. What we're watching today: The never-ending back-and-forth over attempting to repeal the individual mandate through Republicans' tax overhaul. For your radar: The White House budget office is reviewing a proposed rule on short-term insurance plans — a key piece of Trump's most recent executive order on health care.